When I first moved away from home and expected it to be permanent (which it was), I landed days away from everything that I knew. As expected, I had trials and tribulations which sometimes made me feel down. Friends and myriad distractions and adventures helped tremendously. Occasionally, the weather was miserable and my mood turned dark. So, I hiked to a bookstore and bought a collection of funny papers- most anything would do as long as it didn’t cost much and looked funny and distracting. I don’t seem to be alone in finding comfort in that amazing combination of words and pictures. I have no idea if it’s the same appeal as comfort food, in a way. Some of our first memories are of making that remarkable connection between scratches on paper and the thing that they mean. Everyone who learns to read must harbor some deep-seeded joy at making that revelation. By that time, I was browsing the comics section of bookstores. A few graphic novels started mixing in with the collections of comic strips. 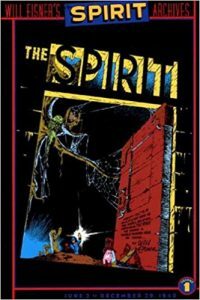 Will Eisner was usually featured in any sort of display, as if the bookseller in charge of the section hoped to endow the jokes with a degree of weight. I ignored those serious tomes and grabbed my Peanuts or Calvin & Hobbes and left. it seems archaic to be churlish about serious graphic novels, but it did feel a little like Maus and Harvey Pekar took the magic out of a little corner of the bookstore which had only been bright sunlight. I was wrong and not only because it meant that comics could finally join the conversation with all the other art forms. Also, I was wrong, but not because I was being so provincial, though that is true. I was wrong because I had forgotten the first rule of Art Club: There are no rules in Art Club. Sure, I dabbled in some of those other offerings in the comic section. I checked out things from Japan and stories that lasted for hundreds of pages. There were books in black and white which could have been in color and black and white that sometimes added red. I liked some of it and didn’t understand some of it. Eventually, I was reminded of Will Eisner because someone at some convention or store was selling these old newspaper inserts that Eisner had created back in the 1940’s. Chock full of strips, his workshop supplied them to papers on a weekly basis. The star of the show was The Spirit. One glance and I had to forget everything I ever thought about superhero comics becoming mature in the 1980’s or anything so ridiculous. These were stories filled with mystery and humor and absolutely my favorite design work of anything produced in the medium. Strange comfort comes from finding innovation where it is never expected. Certainly, change can destabilize our view of the world. Ultimately, it should be the real comfort to know that that first rule of Art Club has always been true and the real innovators always sitting there awaiting our discovery. You’ve Got to Check This Out is a blog series about music, words, and all sorts of artistic matters. It started with an explanation. 33 more to go.